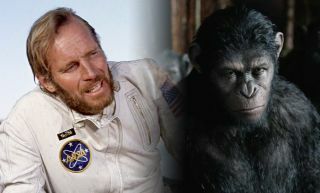 "Planet of the Apes" has strong ties to space exploration. Here, a still from the famous 1968 film that kicked off the franchise and the upcoming "War for the Planet of the Apes." When "War for the Planet of the Apes" hits theaters Friday (July 14), viewers will see genetically engineered chimpanzees at war with humans, carrying on a storyline that started with two previous films in 2011 and 2014. It's a nasty parable about the dangers of meddling with nature — something that has a great legacy in film history ("Jurassic Park," anyone)? But probe down into the franchise's roots (including the original 1963 book by Pierre Boulle), and the history is not about genetics — it's actually about space. The famous 1968 film that kicked off the movie franchise — "Planet of the Apes," starring Charlton Heston — began with astronauts crashing into an unknown planet. A rebooted series in 2001, starring Mark Wahlberg, starts off with astronauts and apes working together, exploring space in the future. Some context here is helpful. When the first five "Planet" movies were in theaters between 1968 and 1973, NASA astronauts were busy exploring the moon. The first moon mission — Apollo 8 — took place in 1968, when three astronauts orbited Earth's lunar companion. The first moon landing quickly followed in 1969, followed by six attempted landings (five were successful) between 1969 and 1972. So space exploration was a big freaking deal back then, in a world that was dominated by television coverage rather than social media. And this was reflected in many films of the era, ranging from "2001: A Space Odyssey" (1968) to "Marooned" (1969). "Planet of the Apes" (1968) kicked off the franchise with astronaut Taylor (Charlton Heston) and crewmates in deep hibernation; they are voyaging for nearly a light-year and need the hibernation to slow down their natural aging processes, since the voyage takes a long time. Their spaceship crash-lands in a lake, killing one of the astronauts and waking up the rest of the crew. The crew members discover that it's the year 3978, about 2,000 years since their 1972 departure. They quickly come across some armed and very unhappy gorillas that attack the crew, killing more astronauts and capturing Taylor. From here, we'll skip straight to the end, where Taylor discovers the Statue of Liberty on a beach and realizes this planet is actually Earth … after a nuclear holocaust. The sequel "Beneath the Planet of the Apes" (1970) saw another spacecraft crash on a future Earth in a search for Taylor and his crew. Suffice it to say, the gorillas are no less friendly, and Taylor ends up killing all life on the planet with a "doomsday" bomb that he discovers. From here, the franchise lessened the emphasis on space, focusing instead on conflicts between humans and apes in the movies "Conquest of the Planet of the Apes" (1972) and "Battle for the Planet of the Apes" (1973). Meanwhile, the franchise spun off a brief 1974 television series, "Planet of the Apes," that had pretty much the same premise. Astronauts landed on a future Earth, but in this case, the astronauts were clearly identified as originally going to Alpha Centauri, and they deduced almost right away that they had landed on the wrong planet. Another television series, this one animated, took place between 1975 and 1976, with Earth astronauts being hurtled into the future and landing on a planet full of apes. This was called "Return to the Planet of the Apes" and only lasted 13 episodes — not long enough for us to know if the astronauts escaped. Hollywood then revisited the franchise in 2001, with Mark Wahlberg starring. Although the 2001 movie shares the 1968 movie's name — "Planet of the Apes" — the plot is pretty different. Wahlberg plays an astronaut named Leo Davidson in the year 2029, working with primates on the United States Air Force Space Station Oberon. One of the apes, Pericles, goes to the sun in a small space pod to investigate a coming storm. After Pericles disappears, Oberon disobeys a direct order and follows her in a second pod. The pod enters a time-travel warp, and Davidson crash-lands on a planet called Ashlar in the year 5021. This is no less nasty a place than the 1968 future Earth, as the primates here use human beings as slaves. Predictably, Davidson is taken as a slave and has some misadventures as a result. His ship, funny enough, becomes an object of worship by the apes, who are convinced it is related to the apes' god. They call their temple-ship Calima because those are the visible letters on its surface. In reality, the visible letters are a part of the phrase, "Caution LIve aniMAls." In the 2001 movie, space comes into play once again: Davidson escapes Ashlar and uses the same geomagnetic storm to bring his ship back to "present-day" Earth (which is the year 2029 in the film). Unfortunately, it turns out that time is forever altered; Davidson is greeted by news reporters, police officers and the like — all apes. And there you have it: our handy guide to the space origins of the "Planet of the Apes" films. While the recent reboot films have all been bound to Earth, we can't wait to find out if future entries might take the series back to its cosmic roots.